The 'other white meat' iconic ad campaign changed what we thought we knew about meat, and set the stage for the age of spin.... The well-strategized evolution of pork, over an iconic 18 year-long campaign, was one of my first lessons in how profoundly public perception could be shifted profoundly, through the simple act of repetition. Back in the '90s, I spent an inordinate amount of time on two wildly unproductive pursuits: exploring the brave new world of the Internet, and arguing with people about the nature of pig meat. The more time that passes, the more I see how closely those two obsessions were related. Because whenever I hear someone parroting the phrase "fake news," a little part of me always hears "other white meat." If we were to put pork on trial, I know that my case against its status as white meat would not be airtight. More than 30 years ago, the New York Times noted that the dictionary itself "lumps pork right in the white meat category along with chicken and turkey" (albeit secondarily). And as a casual meat eater myself, my primary focus when approaching food is usually just whether it's an animal or not. But the well-strategized evolution of pork, over an iconic 18 year-long campaign, was one of my first lessons in how profoundly public perception could be shifted profoundly, through the simple act of repetition. Back in olden tymes, pork was uncontroversially considered a red meat, like beef or lamb. The reasons for the classifications are not singular: it was a means of distinguishing a certain type livestock from others like poultry, and also identifying foods with a higher myoglobin content, which gives them a redder pigment. But regardless of the reasoning, there wasn't much semantic debate over it, because meat ruled as the thing most likely to be found in the middle of your dinner plate. Then the health conscious '70s and '80s came along, and a new supermarket favorite went bok bok bok all the way home. Facing rising more demand for low-fat consumer goods and rising poultry consumption, in 1987, food trend experts estimated that chicken was poised to "push pork out of second place in consumer hearts" behind beef. That year, the National Pork Producers Council rolled out an efficient new motto: "Pork. The other white meat." As the Times reported back then, an extravagant television and print campaign recast pork as a healthy, modern dish, one lower in fat and calories than its reputation would have you believe. "If you serve chicken because it's light and nutritious, you should serve the other white meat, pork, for the same reasons," boasted one early magazine ad. Pork was porky no more. 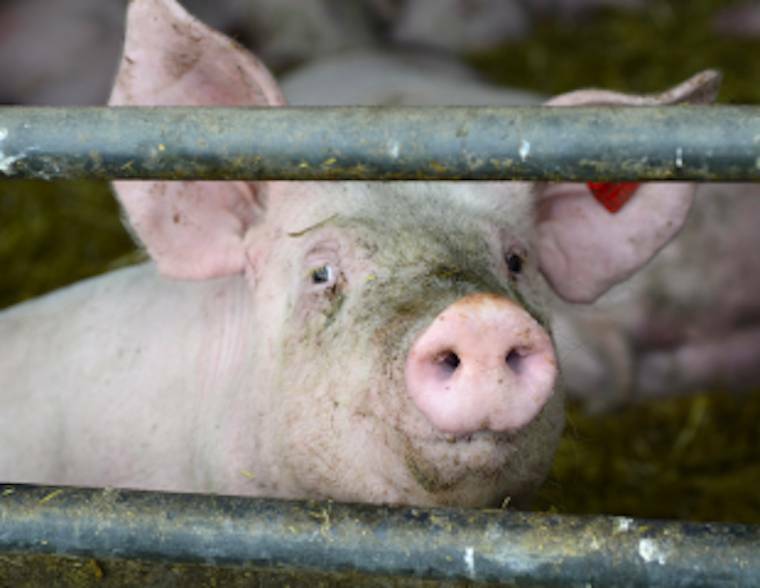 The strategy was a hit — over the next five years, pork sales would increase by 20 percent. (Five years later, the beef industry, taking a different approach, would patriotically declare of its product that "It's what's for dinner.") A 2000 study ranked "the other white meat" as the "the fifth most memorable promotional tagline in the history of contemporary advertising." Not everyone, however, was swallowing the tetrazzini, and some nutritionists argued the campaign was "misleading." Jayne Hurley, a nutritionist for the nonprofit Center for Science in the Public Interest, told the Los Angeles Times in 1991 that the industry had "not proved" that pork was truly "the other white meat." The pork biz wasn't just talking the white meat talk, though. It was changing the nature of the product itself. In less than a decade, pork had become roughly31 percent leaner, thanks to "breeding and a lower-fat diet." And that leanness also made for a lighter colored product. Yet the distinctions around cuts and preparations have not always been clearcut in consumer minds. I still remember arguing with a friend in Boston that a plate of ribs was never going to be "white meat," and that this was the hill I'd gladly die on. I remember rolling my eyes when a dieting family member justified ordering a pulled pork sandwich because, "You know, it's white meat." "According to whom?" I'd replied, in the same combative mode I usually reserve for debating the artistic merit of "Love, Actually." But I think the deeper reason I get so uppity is that over time, pork has become my metaphor for something seemingly becoming real because it's said often enough. You know why Michael Jackson is the King of Pop? Because he decided he was and then got people to repeat it a lot. In the early '90s, he dubbed himself with that title and insisted that MTV refer to him by it. Now, even in death, the legitimacy of his crown remains undisputed. More recently, Florida House candidate Melissa Howard was caught falsifying information about her college education and then turned around to accuse the media reporting it as "fake news." It wasn't hard to tell where she learned that doublethink can be incredibly effective. War is peace. Freedom is slavery. Truth is fake. Lies are alternative facts. An unedited tape is "fudged." Pork is poultry, and not-meat is meat, maybe? In the abstract, any brand — whether it's an industry or an individual — can choose its own descriptors. So what if what was once red is now deemed white? How different is that from a mint proclaiming itself a "freshmaker"? Or a beer anointing itself "the champagne" or "king" of beers? It's all just adjectives anyway. But the pork thing has always stuck with me, and always made me deeply uneasy. I can Mandela effect as well as the next guy and I only earlier this month learned that perspiration does not detoxify. I bring my own bias and half baked bag of baggage to the table every time. Yet I also watched, for two decades of my own life, how people could go from believing one thing to another, based not so much on evidence but just hearing it confidently and frequently told to them. And if we can be that swayed about a grocery store product, well, just imagine the havoc that somebody with real life and death power, dominating a 24/7 news cycle, could wreak by using the same two-word soundbite, again and again, for every challenge to his authority. Mary Elizabeth Williams is a staff writer for Salon and the author of "Gimme Shelter: My Three Years Searching for the American Dream."